ABOUT THE CONFERENCE: The International Conference on Natural Resources Management (NRM): Towards Inclusive and Sustainable Agriculture 2018 aims to offer the opportunity for knowledge sharing, networking and collaboration among interdisciplinary researchers that considers the physical, biological, economic and social aspects of handling natural resources. For this year the committee has chosen “Harmonizing Environment, Social and Economic Dimensions” as a theme, with six (6) selected areas namely the earth or physical sciences, sciences of biotic resources, social sciences, pollution control, environmental communication and the economics of natural resources. Keynote speakers from Indonesia, Malaysia, France and Pakistan will share their theoretical and empirical expertise and experience in these areas. This conference is a collaborative effort by 3 parties. 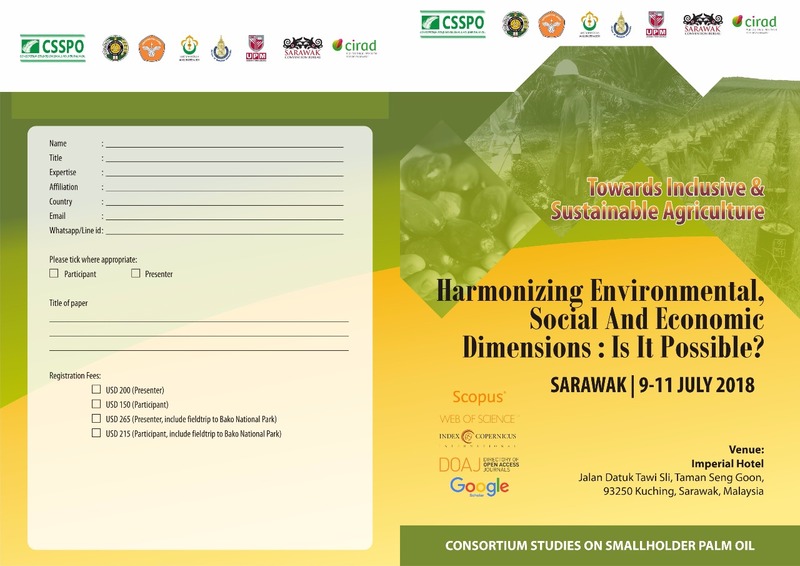 The parties are the CSSPO (Consortium Studies on Smallholder Palm Oil), the SCB (Sarawak Convention Bureau) and the CIRAD (The French agricultural research and international cooperation organization working for the sustainable development). The CSSPO consists of 3 universities from Indonesia (Universitas Sumatera Utara, Universitas Jambi and Universitas Malikussaleh), 1 from Malaysia (Universiti Putra Malaysia) and 1 from Thailand (Prince of Songkla University). The conference will start with a networking dinner. On the second day the 1st session will involve 4 keynote speakers and it will be interactive. The second session will include papers and posters from the participants. The conference will be closed with a post-conference tour. 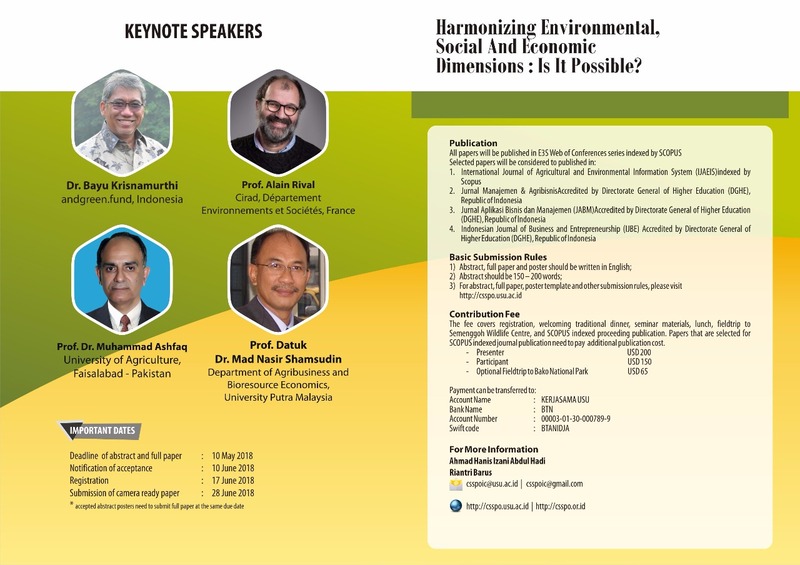 CONFERENCE THEME: Harmonizing environmental, economic, and social dimensions: Is it possible?